Nylon or stocking flowers look very pretty ,delicate and can be made easily with a few things. They make excellent decorative pieces when displayed in a bunch in a vase or a bouquet. 1 Nylon or stocking in various colors . 2 Wire -thin golden wire for flowers and leaves ,its easy to give shape to petals and looks good too.Thick wire for making stems or one can double up golden wire for thickness. 1 Make a ring or a hoop with the golden wire for petals . A simple way to get the same size is too wrap the wire round a bottle and cut off the excess wire. Make several hoops as they will be used for making petals and leaves. Make slightly smaller ones too for smaller petals and leaves. 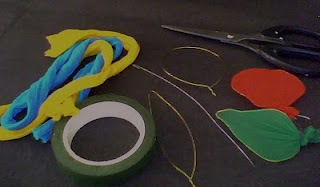 2 Wrap nylon tightly round a hoop and tie it with thread. Make as many as petals needed.Pull out the hoops to make petal shape. 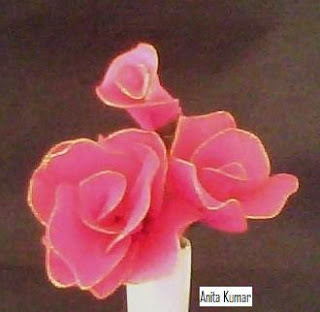 3 Take a 6" plain wire for stem and make a hook on one end for tying the petals. 4 Tie the stamen and pollen stalks to the stem hook with thread. 5 Start tying each petal to the stem wire with thread in the shape of a flower. 6 Wrap the stem wire with green floral tape . 7 Finally give a natural shape to the petals by opening them slightly outwards . 1 Cover a hoop with green nylon or stocking and tie it with thread. 2 Make several and pull them out in an oval shape slightly to give a leaf shape. 3 Add the leaves to the stem with tape and glue. 4 Shape hoops into petals. 5 Attach each petal to wire stem with thread to form a flower. 6 Make leaves with elongated hoops and cover with green nlyon. 7 Cover wire stem with green floral tape. 8 Attach leaves with tape or glue. Make several flowers and leaves for pleasing visual effect. i want a (some)help from u.can u tell wat book is highly useful in one stroke painting book nd important other art n craft materials which v can buy from abroad countries. Hi Raje,please have a look at One Stroke Painting post in the blog. We provides nylon stocking flower materials, clay buds, flower center,floral tape, flower making wire, Nylon Stocking etc. For learning stocking flower art & purchasing the raw materials of nylon stocking flower you can call or can whatsapp. Local craft shops keep stocking flower material or you can try online craft stores .